During our regulars dives in Tioman Island, we noticed that there are some reef areas that have been damaged due to enviromental and human factors. This devastation is taking its impact not only on the survival of Corals but also all the marine lives in our seas. Our objective is to create five Coral nursery patches in stratigic areas to serve as a natural growing habitat that is self-sustaining for all marine organisms. The process in which we intent to use is called "Coral Propagation". This campaign will create more awareness of our state of Coral Reefs and the need to take more positve action in regards of protecting it. This campaign will help us to raise funds to which we will be able to build a nursery patch where coral fracments can grow and at a later date can be replanted into an existing Coral Reef. 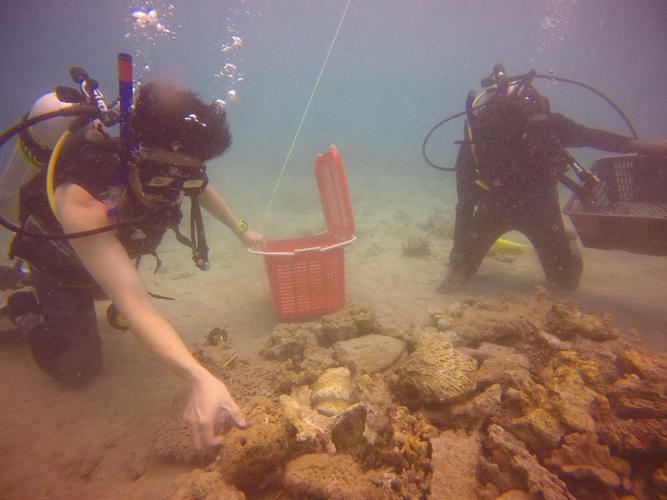 As recovery is slow, extra funds would help us to monitor and maintain these coral nurseries. We hope thrugh our efforts, the corals that we have propagated, can re-colonize the reef and restore the balance in the ecosystem. A successful campaign can create more habitat where marine life can congregate and thrive. We are planning to build a Coral Reef Nursery in Tioman Island in Feb 2019. The Nursery would use Natural Life Rock as Substrate for Coral Propagation. We would be using the Ocean Quest Coral Propagation Methode to create and build this new Coral Reef Nursery . The Coral Nursery building objective is to re-grow small Coral Fracments into Matured Corals ,which in return can be replanted into the existing damange Coral Reef .